St Johnstone reached the Scottish League Cup quarter-finals after victory over 10-man Queen's Park. Saints went ahead when Steven MacLean flicked home his first goal for the club, while Queen's levelled through Michael Keenan's 35-yard strike. MacLean got a second to put Saints back in front before the Spiders went down to ten men when Andrew Robertson was shown a straight red card. And late goals from Murray Davidson and Liam Craig sealed the win. Saints, in good form after successive Scottish Premier League wins over Celtic and Ross County, passed up an early opportunity when MacLean shot over from inside the six-yard box after only six minutes. However, the striker made amends when he bundled home Daivd Robertson's cross from close range to open his Saints account. The home side went looking for a second to kill the tie, but were almost caught out by a quick Queen's counter. Hotly-tipped youngster David Anderson fed Jamie Longworth after dispossessing David McCracken, and Saints keeper Jonny Tuffey had to force Longworth's 20-yard drive over the bar. However, this was a taste of things to come, as Keenan's spectacular shot from distance flummoxed Tuffey, who could only palm the ball into the net off the post. 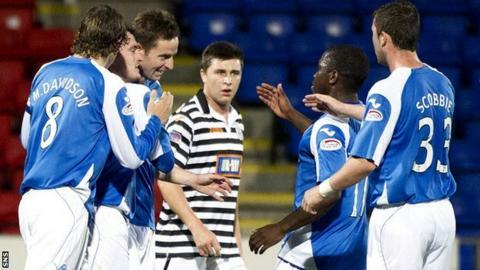 MacLean then shot over again after Nigel Hasselbaink and Gregory Tade combined to set up the former Rangers youngster. But, MacLean finally netted his second to calm McDiarmid Park nerves with a 14-yard strike after Murray Davidson played him in. Steven Anderson's header should have increased the home side's advantage, but his free header hit the bar and went over. Then, any hopes the Spiders had of getting back into the game evaporated as Robertson saw red for a lunge on Saints right-back Gary Miller. Davidson scored Saints' third shortly after with a finish from the edge of the box, before Craig's volley made the victory secure. St Johnstone manager Steve Lomas: "This was all about mentality on the night. "We got a few goals as well which makes it all the more pleasing, so all in all it was a pretty good night's work. "I'm pleased for Steven MacLean to get those two goals. "He's like any striker who needs goals for his confidence and hopefully he can go from strength to strength." Queen's Park manager Gardner Speirs: "We were well beaten. We've got to hold our hands up. "When we got the equaliser we thought we might have gone on to do something but then they went back in front not that long after. "But I can't fault the lads for their effort. They worked extremely hard so all credit to them - although we know ourselves that we can do better. "It obviously didn't help when we then went down to 10 men near the end."